What is The Precipitube® Humidifier? Designed for violin, viola, and cello cases, The Precipitube® Humidifier is a tube which contains special absorbent crystals. 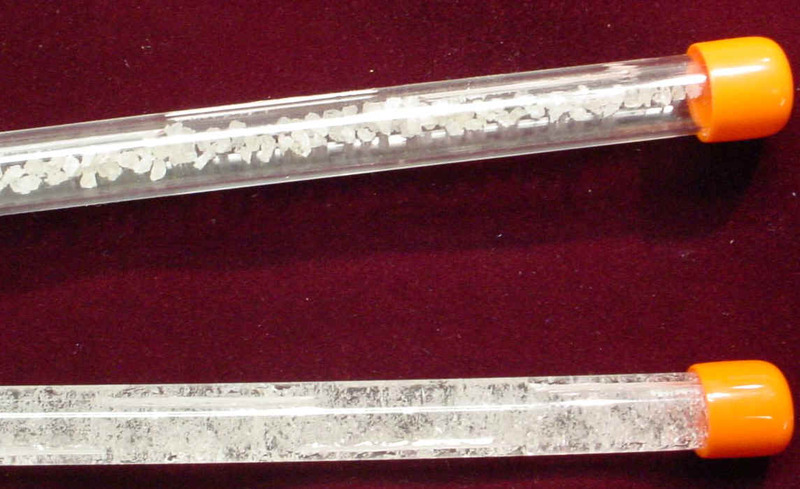 These crystals can be used over and over again, absorbing water up to 100 times their weight and expanding to over 20 times their dry size (photo: left). The Precipitube® can keep your case at the recommended level of approximately 40-50%. 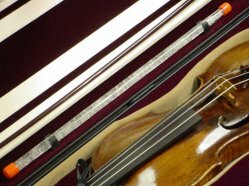 Best of all, The Precipitube® is a case humidifier and can offer protection for your instrument as well a stable humidity level for your bows! No other instrument humidifier on the market can hold and disperse as much moisture in the same time as the Precipitube® Humidifier. The Precipitube® replaces the generally unused string tube in your oblong case with a tube specially designed to be removed time and time again. The Precipitube® Humidifier can also be retrofitted with the screw-on clips. Click Here to Order your's on Online Now! How do I Use The Precipitube® Humidifier? Just soak, clip, and go! To use The Precipitube® Humidifier, simply place the tube horizontally in 1" of clean water for 10-15 minutes (every other soaking, add 1 tbsp of bleach per gallon of water), wipe dry, and clip your Precipitube® into your case, and close the case. The Precipitube® does not come in contact with the instrument so no water damage can occur. In most climates, re-hydration only needs to happen every 7-10 days! More questions? Visit our Precipitube Frequently Asked Questions page for more information!